On Thursday, you will focus your basic efforts on fulfilling various professional or business engagements. This will be a good day to visit a state, bank, court or other institution. Problems or relationships that have bothered you in your home lately will now have the potential for a natural solution. Thursday will be a good day to receive money or to settle financial issues. Beneficial effects in this plan can be obtained from a person born under the sign of Libra, Aquarius or Gemini. Thursday will be an unfavorable day of travel or you will cause different changes and delays in a planned trip. If you were born under the sign of Aries, Leo, or Sagittarius, on Thursday you will try to find a solution for trouble that continues. There is an important conversation or event related to a man, most likely over 35 years of age. This day will be important to the men born under these three zodiac signs because of the beginning of an important change in their lives. If you were born under the sign of Taurus, Virgo or Capricorn, today you will have a commitment or conversation involving a young man that will be important to your plans. New acquaintances today will be unclear as development, and in most cases will be with younger people than you. This day marks an important child-related event. 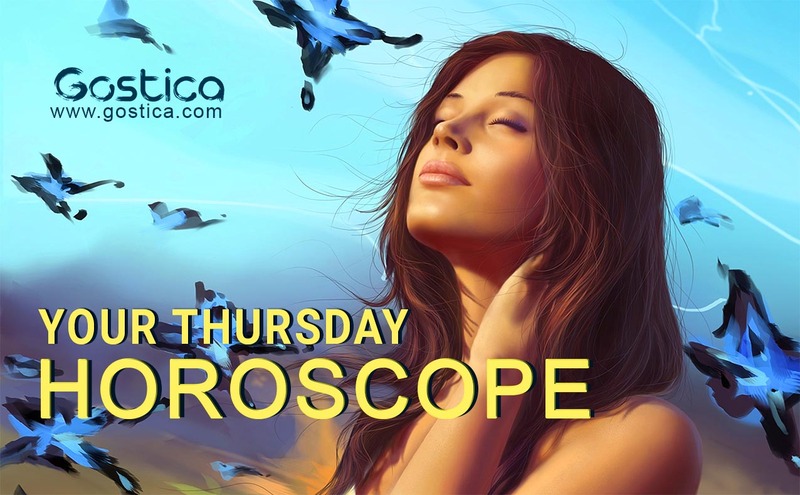 If you were born under the sign of Gemini, Libra or Aquarius, Thursday will be a day of surprises for you. They will greatly change your plans for this month, or they will have some relationship to your love life. Small earnings or nice news related to money are possible. If you were born under the sign of Cancer, Scorpio or Pisces, do not make any important plans for today. Almost nothing will happen to your expectations. Of course, this day will have its own beauty and meaning for you. This will be a good day for treatment or you will receive news related to the recovery of a sick person from your family or friends circle. All the activities of yesterday will have to be plumbed to find any faults or errors. Do not worry about those of others, but only yours. You probably did everything right, but better to check. A moment of distraction happens to everyone and at this moment it is necessary to be precise, as much as possible, to avoid accumulation of work. Even in the family, we will have to do our best to help. Requests and proposals do not always go hand in hand, but in today’s case yes. Someone will ask you a request, but will also offer you something in return. Listen to it. Even if you usually propose or make requests, today there will be a reversal of the situation, to allow you to better appreciate the extent of your task or the respect they have for you. Stay attached to your ideas, at least for today. Commit yourself to carry on with the necessary effort and, at the end of the evening, you will be able to understand if they are still feasible or not. Do not give it up regardless. Just because someone put the flea in your ear does not mean they’re right. Maybe you can evaluate and modify something, but after all, it could also just be a way to get into trouble. Try to stay away from negative people. Even today you might come across them. Such kind of people have the power to transform a beautiful day into a melancholy, so better stay away. On the other hand, your mood will be very important for the people around you, for your friends or your family, so try to give yourself a shock to always be happy and carefree, as you should. You have to approve or reject some invitations this day. They could relate to work or private life, but you should use the same criterion, or the practicality of the same, especially in the results that they should generate. It may seem bad to reduce effective questions in an opportunistic reasoning, but sometimes it is good that those in front of you understand that you are not always available at all. You will avoid exploiting them! Once again you have doubts and anxieties about the issues that concern you more from afar. What’s the point of getting angry for something that does not concern you? Yours is not altruism, so take care not to confuse. A person who is next to you is asking for more presence, but you continue to deny it because of various and unspecified reasons. If you are honest with yourself, you will understand that they are right.